When it was time for Elizabeth's baby to be born, she gave birth to a son. And when her neighbors and relatives heard that the Lord had been very merciful to her, everyone rejoiced with her. So often today, it seems that those who are not blessed with unexpected joys are jealous, even critical, of those who do receive them. Isn't it wonderful that Elizabeth's neighbors weren't that way? 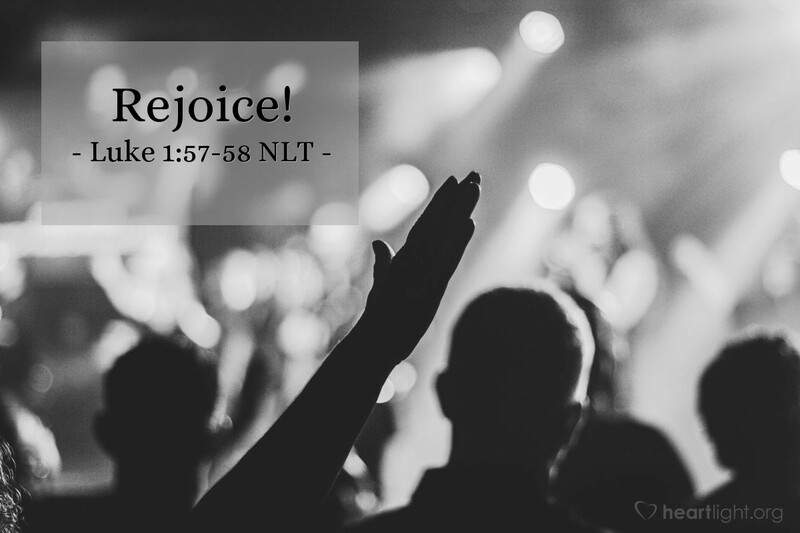 We can follow their lead and rejoice with those who rejoice! In fact, even beyond the example of those who rejoiced with Elizabeth, we are instructed to rejoice with others (Romans 12:15 NIV). Find things in your friends' lives for which you can honestly rejoice. Doing so makes their blessings a source of blessing for you, too! Seems, dear God and Almighty LORD, that there is so much bad news these days. Sometimes, I don't seem to find the good in the things around me. Give me a heart that rejoices with the blessings of others. Make that joy contagious. I ask for this grace in Jesus' name. Amen.